Is Spotify about to go all Nate Silver on the Grammy Awards — by which we mean rigorously applying data to know that which would otherwise be unknowable? Well, the company is giving it a shot. The following predictions are “based on song and album streams on Spotify,” which made us wonder whether Spotify has some sort of algorithm that can skew the data towards the baby-boomers-and-older set who seem to pick the winners each year. 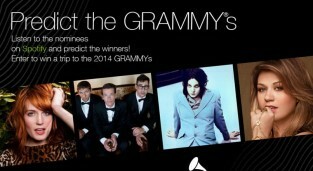 For those who would like to make their own predictions, Spotify offers a Facebook app where you can submit entries in ten categories for a chance to attend the Grammys in 2014. Everyone who picks the winners in all ten categories will win six months of Spotify freemium, which is about a $60 value.